In 2010 a friend showed me this photo of the exquisite Scottish Storytelling Yurt. 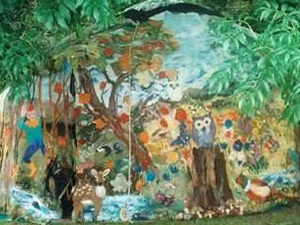 Her daughter had been one of the members of the International Feltmakers Association responsible for creating this inspirational yurt. As soon as I saw the photo and discovered that it was available for hire, I simply HAD to have it. Sadly, it was not to be. It had started life as a Millennium project and was now getting a bit frail. But oh how I wanted it.... so why not make our own? Over the next few weeks, I came aross a number of other people who said that they, too, had wanted to make a yurt for fifteen years. Yes, surprisingly this was a a common timeframe. Time to talk to Matt Boysons at Yurtopia in Stanmer Woods, seen below on the day we erected our finished yurt for the first time. 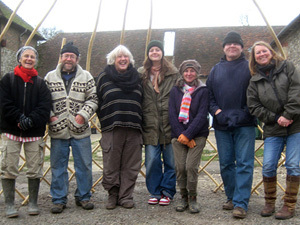 The happy Yurt Team [L-R] Jane, Matt, me, Helen, Katy, Bill and Paula. Just over a year later and we've finished the main structure (actually we still have to add the fancy bits to the crown). The yurt's first public airing, outside the tractor workshop in Stanmer Park, was documented by Takahiro and Alan who have made a beautiful 6-minute film about Matt and the excellent work that he does. You can see for yourself here: Nomadic Soul with a glimpse of us every now and then. We loved working in the woods SO much that some of us have found it impossible to stop.